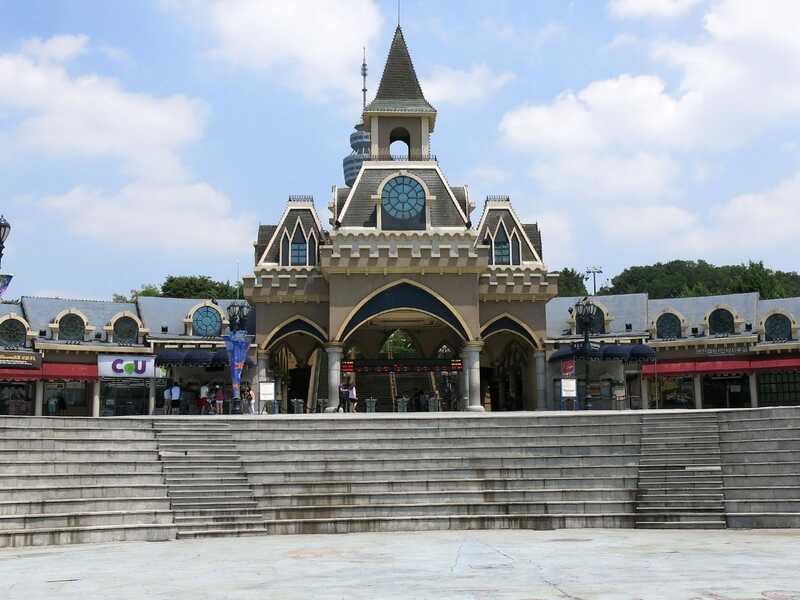 My second day of Korean parks was planned around the city of Daegu. I'd hoped to fit in a brief stop at Pago Land, a park with a single powered coaster, but I couldn't find a convenient way to get there by public transport. Instead, therefore, I decided to give myself a relaxing day at E-World, the park formerly known as Woobang Towerland. My visit began with the Ghost House, a relatively uninspired walkthrough that consisted mostly of badly lit paintings showing screaming cartoon figures. While the experience didn't do much for me, a number of young children were clearly frightened by what they saw, as they were moving through the attraction at high speed, the patter of their feet accompanied by excited yelping noises. One of them ran right into me, and much to my surprise, apologised in accurate Korean-accented English. One wonders whether any seven year olds from an English-speaking background would be able to express themselves as eloquently in Korean. From there I went to Hurricane (#1919), a looping corkscrew ride that was closed on my last visit to the park. There were several people already in the train when I approached the station, but the front was still available, so I parked myself there. I'm pleased to report that the ride handled fairly well, apart from one violent thump at the entrance to the corkscrew element. One lap was enough for me today, but only because the ride wasn't interesting enough to justify a repeat. With the only new credit out of the way I decided to visit the park tower, both for aerial photographs, and to ride the original Skyjump. Unfortunately, while the tower was open, the jump was not – as the only person in the building apart from me was the lift operator. 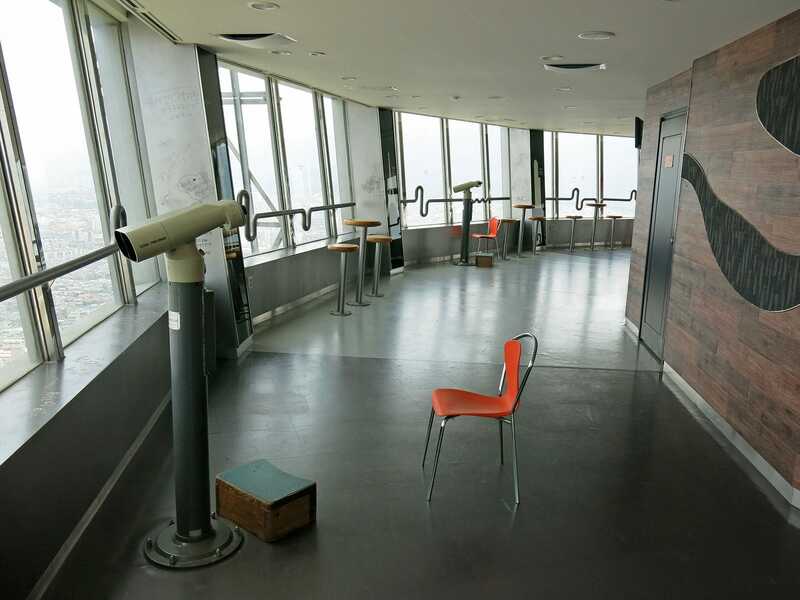 It felt very weird to wander around an empty viewing deck, but on the plus side, nobody got in the way of my pictures! Once back at ground level, I took a lap on the other three coasters; Camel Back, Boomerang, and Magic Castle. My last stop was at the Aladin funhouse, which might have been worthwhile were it not for the fact that well over two thirds of the effects were out of order. It was also very odd to find a room in the middle of the attraction that contained nothing but photographs of military hardware; for one brief moment I found myself wondering if I'd wandered into North Korea by mistake. To get to E-World, take the Daegu Metro to Duryu. The station exits into the middle of a shopping mall. Follow the signs to exit fifteen, then walk one block to the park.